Nathan Montgomery was all smiles during his first game back on the field at a tournament with his traveling team (True Ohio) following his Long QT Syndrome diagnosis. Nathan Montgomery’s season came to a sudden stop for the Big Walnut boys lacrosse team this spring because a routine checkup found a seemingly career-ending diagnosis. Spoiler alert: this story has a happy ending – just a very scary beginning and middle. Montgomery was in the midst of his junior season as a midfielder. The Golden Eagles were turning the corner with three wins in five games after a 1-5 start. 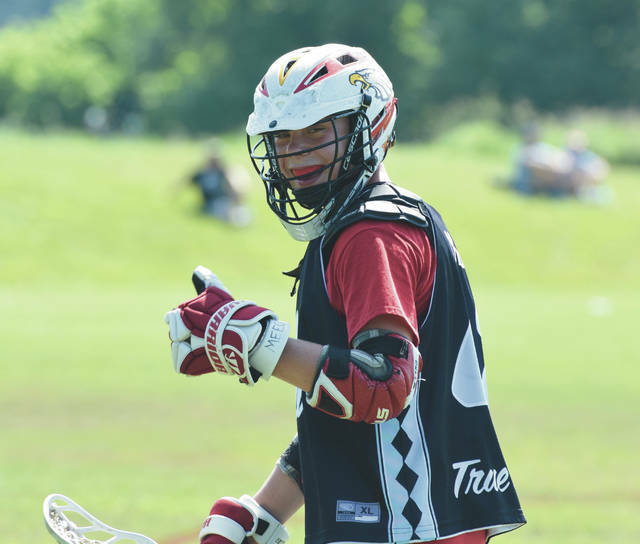 He was one of the team leaders, amassing 22 goals, eight assists and 62 groundballs through 11 games and was enjoying a five-game stretch in which he scored nine goals and helped out on seven others. But a routine checkup through the school, set up by his mother, turned up a possible problem. Montgomery followed up with his physician who used a battery of tests and found that he had Long QT Syndrome. It is defined as, “a disorder of the heart’s electrical activity … that can cause sudden, uncontrollable, dangerous arrhythmias in response to exercise or stress,” according to the National Heart, Lung and Blood Institute’s website. The website added that there is no known reason for the arrhythmias and not everyone diagnosed will have them at dangerous levels, but adds that they can be fatal. It is diagnosed using an electrocardiogram test. The heartbeat has five distinct electrical waves – P, Q, R, S and T. The interval between Q and T is electrical activity in the ventricles or the lower chambers of the heart. This interval is normally about a third of the heartbeat cycle. LQTS is when the interval last longer than normal. The NHLBI estimates about one in 7,000 people suffer from LQTS. That’s only an estimate because it often goes undiagnosed. Montgomery thought – at the very least – his career was over. It took about two weeks of testing out different dosages of beta-blockers before they found the correct dosage and he was cleared to play with no restrictions. Montgomery’s situation had a major impact on the lacrosse team, according to Brunner. The Eagles lost each of their last five games of the season, including a loss to Licking Valley in the first round of the Division II tournament. Brunner says Montgomery is one of his team’s best leaders. He was cleared the day after the team’s tournament loss, which stung. But – equipped with an automated external defibrillator – it’s almost as if nothing happened. “That’s the only time I really think about it is when I see the AED on the sideline,” Montgomery said. Montgomery, who is entering his senior year at BW, hopes to move on and play lacrosse at one of the area Division III schools like Capital or Otterbein. For now – he’s just happy to be back. “I’m not going to let anything stop me,” Montgomery said.